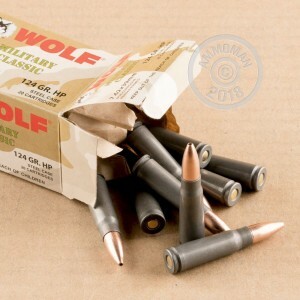 These 7.62x39mm rounds from Wolf use an economical 124 grain hollow point bullet, making them a viable option for hunting or target practice. While this isn't match grade ammo, you'll find it is quite capable of taking down midsized game like deer and hogs at close and intermediate ranges without much difficulty when fired from your trusty SKS or AK. This 1,000 round case comes packaged in 50 boxes of 20 rounds each will give you plenty of target practice or field time at a great price. 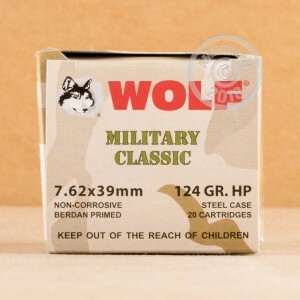 Unlike some Russian ammo, these rounds use non-corrosive Berdan primers for easy maintenance. The steel cases, while not reloadable, are coated for reliable feeding and ejection and perform especially well in Eastern Bloc weapons, which were designed from the ground up to run with steel-cased cartridges. Buy $99 or more in ammo from AmmoMan.com and pay only the list price for your purchases. Then sit back and enjoy free shipping via courier to your doorstep! This ammo is used in an SKS-D and an older AK. never had a miss-fire, even with rapid fire. As always, ammoman delivers great ammo super fast and flawless. No problems with 60 rounds so far! Buy from Ammoman! I used this ammo in a Serbian AK-47 and a Russian Saiga AK-47 with no problems at all. Not one misfire or fail to eject or chamber.